Indian Maritime University (IMU) invites application from eligible candidates for recruitment of following posts in IMU on Direct Recruitment / Deputation Basis. The last date for submission of applications is 18th March 2016. Age Limit: Not exceeding 35 years (Relaxable by the Vice Chancellor by 2 years in deserving cases). Eligibility: Diploma Holders in Mechanical/ Production/ Automobile/ Instrumentation/ Automation/ Control Engineering/persons with TTI Trade Certificate under Apprentices Act, 1961. How to Apply: Candidates are requested to submit the Application form duly filled in to 'THE REGISTRAR, INDIAN MARITIME UNIVERSITY, EAST COAST ROAD, UTHANDI, CHENNAI 600119' on or before 18/03/2016 (Friday) up to 5.30 p.m.
Indian Maritime University (IMU) invites applications from eligible candidates for recruitment of following posts on Direct Recruitment / Deputation basis. Age Limit: Not exceeding 45 years for serving/retired personnel of Indian Navy/Coast Guard. Not exceeding 35/40 years for others [Please see the Recruitment Rules}. (Relaxable by the Vice Chancellor by 2 years in deserving cases). 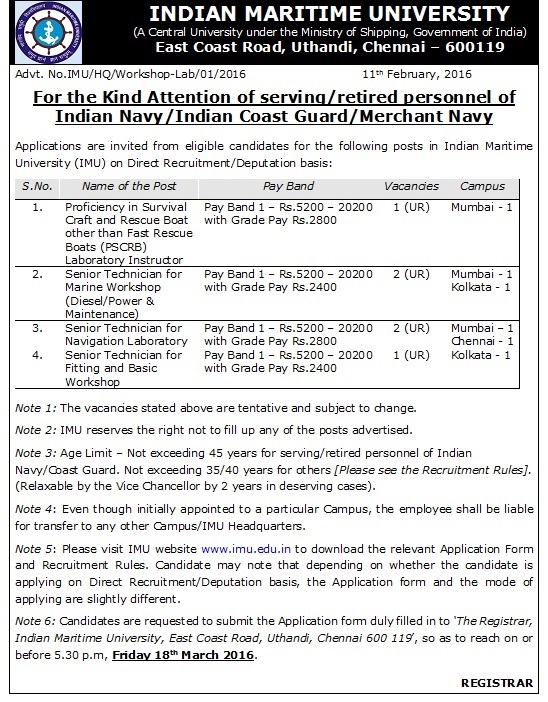 Eligibility: Serving/ retired personnel of Indian Navy / Indian Coast Guard / Merchant Navy. How to Apply: Eligible Candidates are requested to submit the Application form duly filled in to 'The Registrar, Indian Maritime University, East Coast Road, Uthandi, Chennai 600 119', so as to reach on or before 5.30 p.m, 18/03/2016 (Friday). 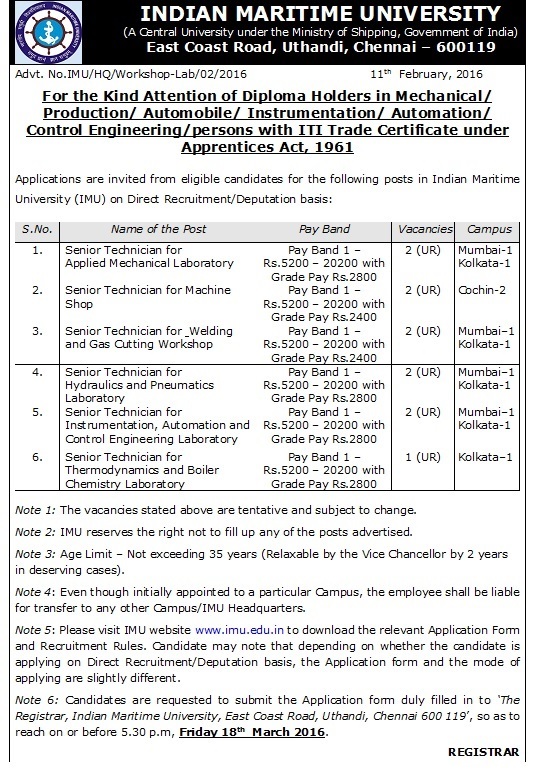 Indian Maritime University (A Central University under the Ministry of Shipping, Government of India) invites applications from eligible candidates for the following posts in IMU on Direct Recruitment / Deputation Basis. Age Limit: Not exceeding 45 Years for service / retired personnel of Indian Navy/Coast Guard (relaxable by the Vice Chancellor by 2 years in deserving cases). How to Apply: Application in the prescribed format, completed application along with photo-copies of documents to reach the Registrar, Indian Maritime University, East Coast Road, Uthandi, Chennai 600 119 so as to reach on or before 11/03/2016 (Friday) up to 5:30 PM. Indian Maritime University (IMU) Chennai invites applications from eligible candidates for recruitment of Library Assistant (Group B) for filling up 10 Vacancies on Direct Recruitment / Deputation basis. The last date for submission of applications is 22nd March 2016. How to Apply: Candidates are requested to submit the Application form duly filled in to 'THE REGISTRAR, INDIAN MARITIME UNIVERSITY, EAST COAST ROAD, UTHANDI, CHENNAI 600119', so as to reach on or before 22/03/2016 (Tuesday).